Consumers wait to buy the iPad Air in Beijing. Android tablets may be on the rise in China, but that hasn't stopped Beijing resident Fu Zheng from buying Apple's latest iPad product. He was among the first to get his hands on the device on Friday when Apple launched the iPad Air at one of its local stores in the city. "Everyone thinks Apple products are good," said Fu, who also own's the third and fourth generation iPads. Apple still remains the leading tablet vendor in China, but increasingly more consumers in the country are buying Android tablets. In this year's second quarter, Apple's tablet shipments to the Chinese market fell to a 28 percent market share, while competing products from Samsung Electronics, Lenovo and little-known "whitebox" vendors saw shipments increase, according to research firm IDC. Apple's China tablets shipments will pick up with the arrival of the iPad Air, and the iPad mini, slated to arrive later this month, said IDC analyst Dickie Chang. "We think Chinese customers will have a positive response to the iPad Air," he said, pointing to the tablet's light weight, thinner design, and improved performance. But in China, Android tablets will continue to eat away at Apple's market share over time, he added. "Lenovo, Acer, Asus, Sony, Samsung, all these vendors are providing Android solutions," he said. "Apple's products I think have good performance and the quality is good, but the price is still different. There are now Android tablets at $100, $150." In China, Apple's iPad Air starts at 3588 yuan (US$585). But on Friday, customers waiting outside the Apple store in Beijing's Sanlitun district were eager to buy the product, despite its higher price over Android tablets. "I've bought Android products before," said a 20-year-old, with the surname Li, who waited in line. "But I think I want to buy a tablet with higher quality," he added, referring to the iPad Air. 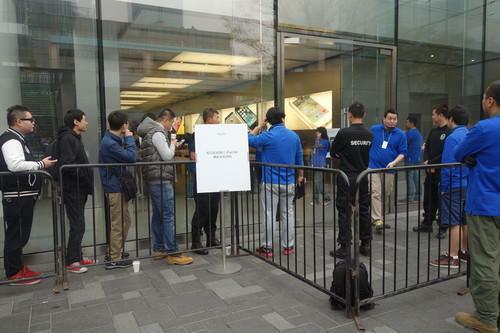 About 50 people waited in line before the Apple store opened at 8 a.m. on Friday. In the past, newly launched products from the company have attracted massive crowds of hundreds when first day of sales started. But since July last year, Apple has implemented a reservation system at its Chinese stores to cut down on lines and prevent customer skirmishes from erupting. "It was easy to make a reservation," said Fan Huajie, who wanted to upgrade to the latest Apple tablet. "I have all of their iPads," he added.